What? He rises again? 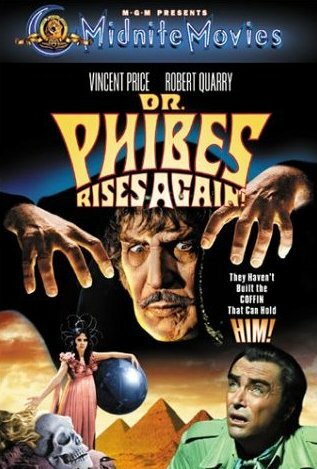 Yep, after three years entombed and hidden away in the basement of his house, Dr. Phibes rises to seek the scrolls of life in hopes of resurrecting his long-dead wife. Er, one problem: someone else wants those scrolls also. In fact, someone else has stolen a very important part of the ancient papyrus from the (cough cough) good doctor's home while he was entombed. He calls upon his helper, Vulnavia, and the two of them begin their quest to retrieve the precious materials, head to Egypt, and diabolically kill any and (almost) all who stand in their way. Brandon and I popped this 1972 classic in the DVD player last night. Oh wow, I'll say it again, Vincent Price is amazing. As Dr. Phibes, he speaks via a device implanted in his neck. Thus when the actor delivers his lines, he doesn't move his mouth. So, think about it, as an actor how much more of a challenge this would be. Gestures, facial movements and expression are still there, but Price certainly does have more of a challenge. But hey, this is Vincent Price. With those devious eyes and brilliant acting skills, he rises (ha ha – pun intended) to the challenge. Plot holes? You could drive the proverbial truck through them. But who cares! Just sit back and enjoy the bumpy ride on this one. Brandon and I both thought this was a great movie, well worth watching. And you know, if they were to find another Dr. Phibes movie locked away in a Hollywood vault somewhere, I'd be first in line at the box office.